Yesterday, I did what I call “Old Mother Hubbard” cooking. I went to the cupboard to see what I had on hand and then made a meal out of it. Some of my experiments are less successful than others. Luckily, this one came out quite well. 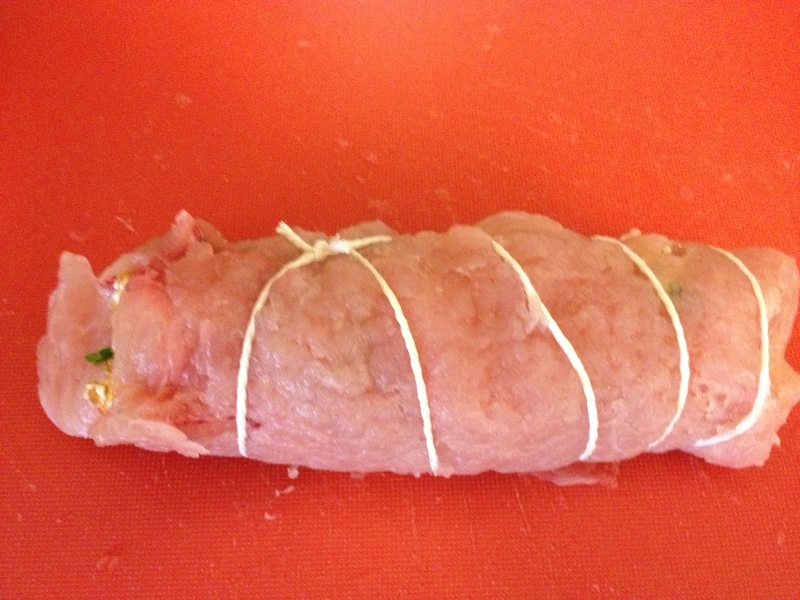 I had purchased some turkey schnitzel because it was on sale and wanted to stuff it to make roulades. “Roulade” is a German dish made of something filled with something, then rolled. Typically, beef roulade is filled with bacon, onions, mustard, and pickles. In Switzerland they call the dish “Fleischvogel” or “meat bird”—for reasons known only to the Swiss. 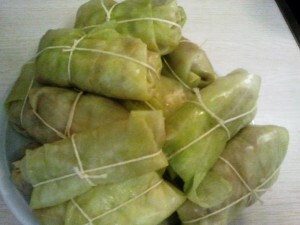 Cabbage roulades are generally stuffed with chopped meat and rice. The ingredients I found in my cupboard inspired me to make the roulades in a semi-Greek style. 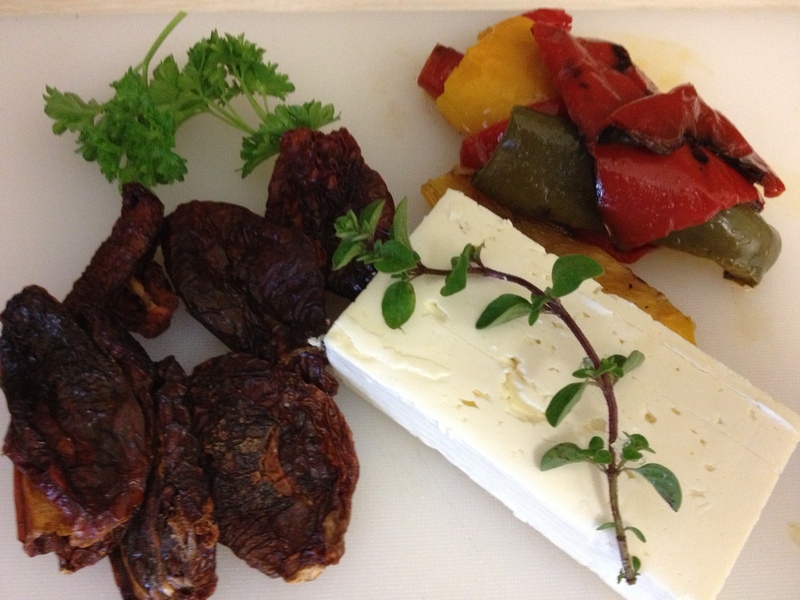 My inspiration: parsley, roasted peppers, feta cheese, oregano, and sun-dried tomatoes. Here’s what I did. First, I pounded the meat to flatten it. When working with turkey, it is important not to flatten it too much. Turkey meat is delicate and can get holes easily. 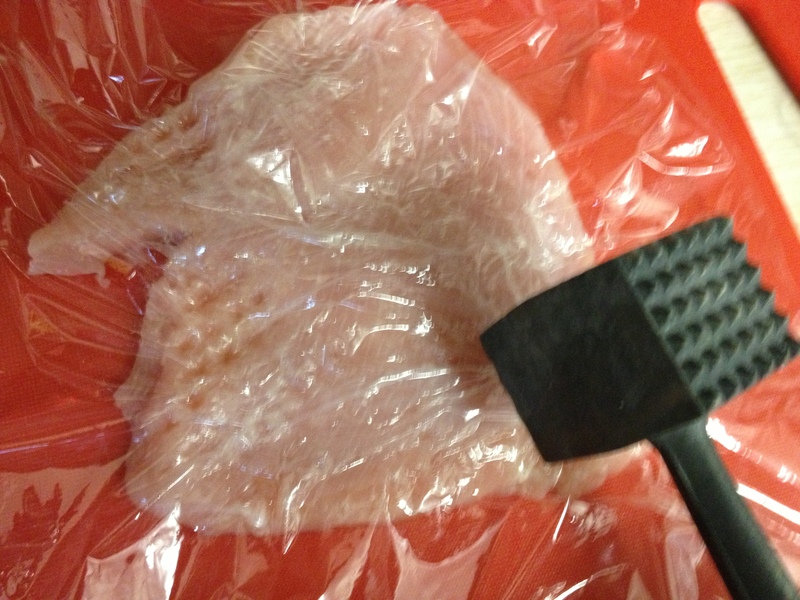 When flattening the meat, it helps to use plastic wrap. Then, I filled the meat and rolled it. There are many different ways of securing the filling inside the roulades. Some people use toothpicks, some use kitchen twine. There are even special metal mini-skewers called roulade needles and round roulade clips that you can buy. I have found my own technique that works for me—I angle the kitchen twine then tie it together at the ends to hold the ends closed. I find that angling the kitchen twine works well for me, but there are many different ways to secure the filling. Feel free to secure yours however you’d like. The main thing is that the filling doesn’t fall out when you are browning them. After browning the meat on all sides you cook it through until done. 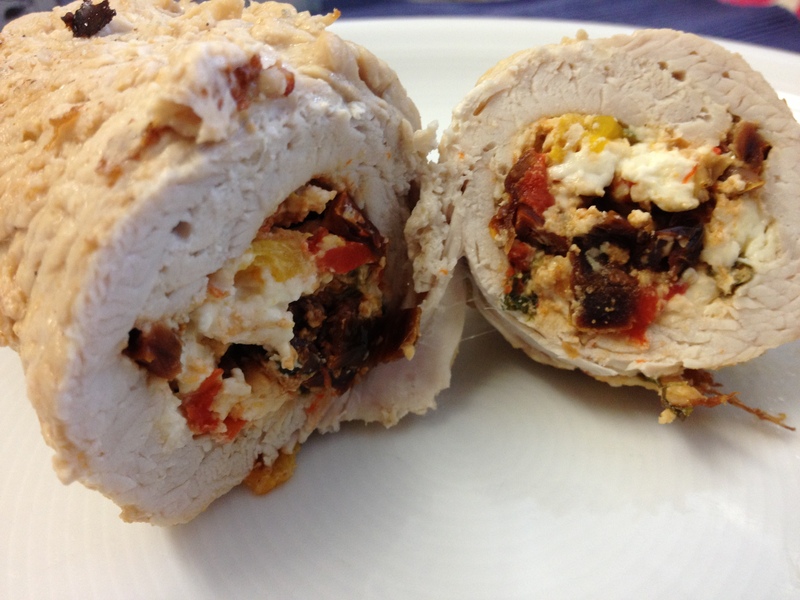 Thin turkey rolls filled with feta cheese, sundried tomatoes, and roasted peppers. Remove feta cheese from refrigerator so it can come to room temperature. Roughly chop parsley, oregano, sun-dried tomatoes and feta and mix in a small bowl. Add one egg white. Mix. 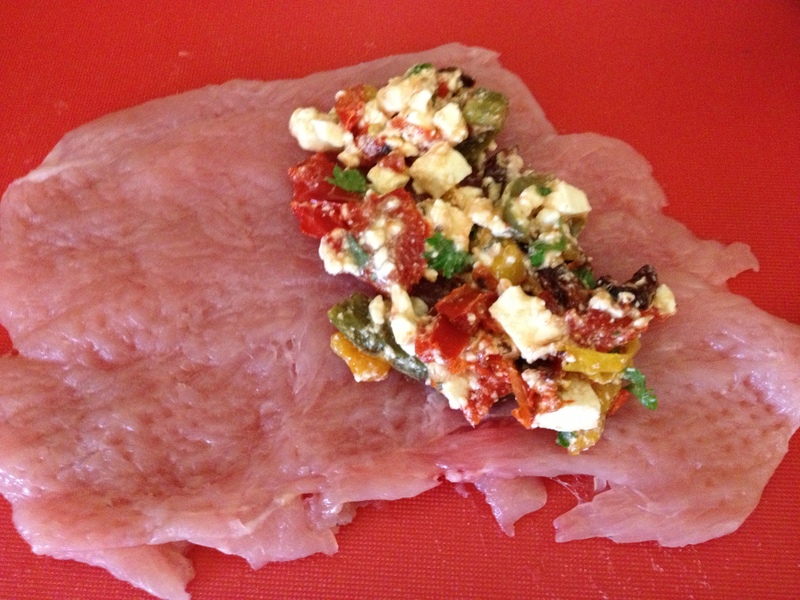 Spread feta mixture over each cutlet and roll up schnitzel with stuffing inside. Secure with toothpick, roulade needle, or kitchen twine. Sprinkle outside of cutlets with sea salt and fresh ground pepper. Heat butter and coconut oil over medium-high heat in a large skillet that can be transferred to the oven. Add turkey roulades and brown on all sides. When all turkey roulades are brown, add wine or chicken stock. Cover and transfer to oven. Cook for 15 minutes or until cooked through. Serve with a drizzle of sauce and a green or mixed salad.